Follow package directions to make oatmeal. 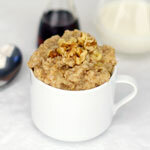 (If using Old Fashioned oats, it's 2 parts water to 1 part oats with a pinch of salt for each serving. 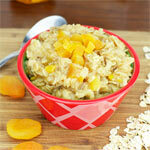 Add oats to boiling salt-infused water, reduce heat to simmer and cook 5 to 6 minutes). Pack the oatmeal in a small greased loaf pan and refrigerate until it can be turned out in a solid mass - overnight or at least 4 hours. Gently, invert the oat loaf onto a cutting board and cut it into 3/4-inch slices. Melt butter in a medium frying pan over medium-high heat. Cook each side of each slice to golden brown - about 4 minutes per side. Top with berries and a generous sprinkle of sugar. 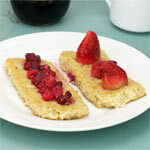 If preparing oatmeal specifically for this recipe: try mixing 1/2 cup of nuts or dry fruit in the oatmeal "batter". Chocolate chips are great, but best stirred in after the oatmeal is cool. Experiment with spices. I like to add a teaspoon of cinnamon or a 1/4 teaspoon nutmeg to the oatmeal. The flavor combinations are endless. This is basically an oatmeal pancake, so most anything you might add to a pancake batter can be added to the oatmeal. As for toppings: Berries and sugar is just one idea. I also love this with a smear of extra butter and lots of pure maple syrup. Anything you might use as a topping for pancakes, waffles or French toast should work. If for some reason your loaf doesn't hold together... no problem. Just make patties out the oatmeal like you would for a hamburger and fry it up that way. This is a great use for any leftover oatmeal. When I make oatmeal from scratch, I'll often make a couple extra servings just so I can see what it's also like fried. If you leave oatmeal out or refrigerate it, it becomes dense and holds its shape to form patties. 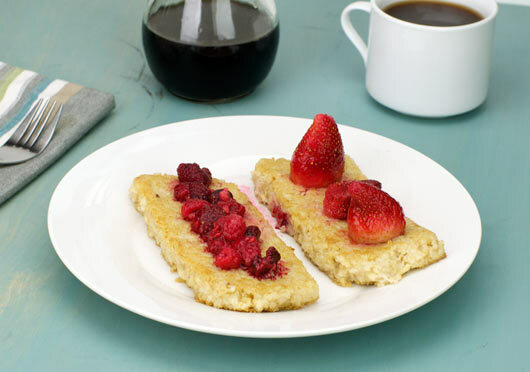 A quick fry-up in a non-stick pan and you'll be eating oatmeal in an all new way. What do you think of Fried Oatmeal Patties? My mother often made fried oatmeal out of leftover oatmeal. I have always imagined that it was a recipe created by thrifty cooks who never threw out anything. She followed the basic recipe above, but she coated the oatmeal slices with flour before frying, which adds some crispness to the crust. Fried oatmeal is now a nostalgia food for my family, something we don't make often, but which connects us to the past. Lovely. I had been hoping there was such a thing as fried oatmeal, so I'm glad your post came up. After reading it, I heated up some leftover steamed cauliflower and did a quick bake of tofu with tamari and olive oil. Not breakfast, but I can't wait to do this again tonight with butter, maple syrup, and maybe some defrosted frozen cherries and surprise hubby with a new dessert. I've had fried oatmeal since I was a little girl. Now I'm 65. It's great with maple syrup. And if you know of it... scrapple fried beside it is also great. To the comment about 'How about fried oatmeal with a little meat mixed in like scrapple!?' - that would be goetta, a German dish popular in Ohio, for one. I like fried oatmeal with leftovers. It fills the void. How about fried oatmeal with a little meat mixed in like scrapple!? Fried oatmeal is really good. I use it instead of hash browns. So while frying the oatmeal, cook a couple eggs, maybe some bacon or sausage and you have a night time breakfast. What else can you put for the toppings? Sounds really good. I threw away some leftovers just yesterday. (kicking self right now). I wonder if you could freeze it and reuse this way??? Oh! BTW, had oatmeal with honey, cinnamon, raisins and nuts yesterday. This finicky cat liked it too. He ate it like it was soft cat food from a can. Is there any reason you couldn't mix bulk pork sausage with the cold oatmeal... refrigerate overnight, slice and fry? Sounds like what we had years ago... but of course after butchering!